American Tourister AT Pops Plus is a three-piece set of 21″, 25″ and 29″ soft shell suitcases for mainly leisure travel, with six color options of black, orange, purple, navy, Moroccan blue and charcoal. As one of best selling luggage sets on Amazon.com it is reviewed by 570 customers at the time of this review and the average rating is 4.1 out of 5 stars. We’ll have a look through their positive and negative experiences. You can push or pull them on two spinner wheels of roll upright on four multi-directional spinner wheels without any burden on your arms. All three bags come with the 360-degree rotating spinner wheels with decent maneuverability. Each bag has a retractable handle as well as side and top padded carry handles that let you lift a full suitcase the way you feel comfortable. You’ll find several pockets inside for organizing your clothes and small items better. They are made of sturdy polyester and all three bags are expandable for some extra space. You can get the AT Pops Plus as a single large 29″ suitcase on different Amazon pages. This option is available only in certain colors. They are shipped nested into each other, the small 21″ into the medium 25″ and the 25″ into the large 29″ suitcase. When you’re not using them, you can put them into each other this way and save on some space in your house. They don’t come with straps to carry a smaller bag but you can always purchase a bungee cord to use as a strap. The suitcases stand upright and not tip over even when they are full. The spinner wheels on these bags move well on different grounds, including the rugs but a thick carpet may be a little challenging. The exterior of these soft shell suitcases do not really get dirty easily. They seem to be resistant to impact and will be fine over your many leisure travels. The smallest 21″ bag weighs 8.6 pounds and measures 21 x 14 x 8 inches without the handles or the wheels and 23.5 inches with the wheels. It is suitable as a cabin bag on some US and global flights and will fit in the overhead bin easily. You can also roll it sideways through the plane aisle so as not to hit people. The medium 25″ suitcase is 10.5 lbs. 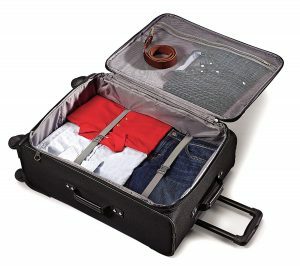 and 25 x 18 x 8.5 inches and the largest 29″ spinner suitcase is 12.10 pounds and 29 x 20 x 9.5 inches. And they both have to be checked in prior to your security and passport control and boarding the plane. Like some of the suitcases you purchase online it is best if you air them outside for at least a few days to get rid of any chemical smells. Please note that American Tourister is a brand of the Samsonite Corporation. They offer very good value for the money: Sturdy build quality, durability, ergonomic design, appearance, expandability and functionality. This is a good quality, well built luggage set at a reasonable price for what it is- very much worth the money.